9x12, l + 282 pp. 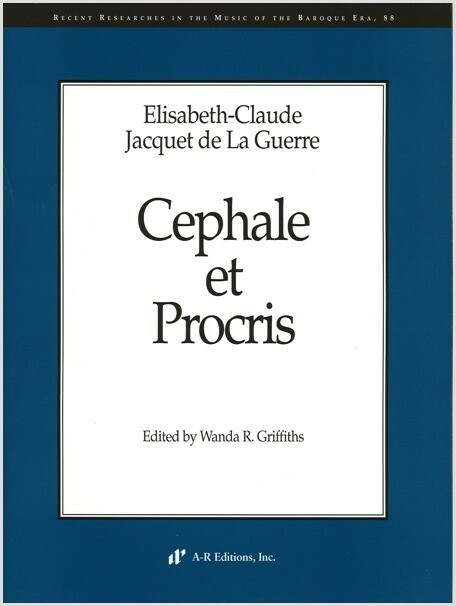 Cephale et Procris by Elisabeth-Claude Jacquet de La Guerre (c. 1666–1729) is her only surviving stage work. Comprised of a prologue and five acts, Jacquet's opera fits well within the tragédie lyrique tradition, which Lully established, and it also exhibits traits of the next generation of composers. Jacquet provides a unique contribution to the genre by incorporating silence for dramatic effect in the opera's poignant final scene. Transcribed from a unique set of manuscript partbooks and parts held at the Bibliothèque Nationale, this edition includes important performance practice information added to the sources by Sébastien Brossard for a performance of the Prologue in Strasbourg in 1696. The manuscript sources include internal choral parts not found in the 1694 published score, and internal instrumental parts have been supplied by the editor. The edition also contains staging information found only in the livret, and a complete English translation of the text.